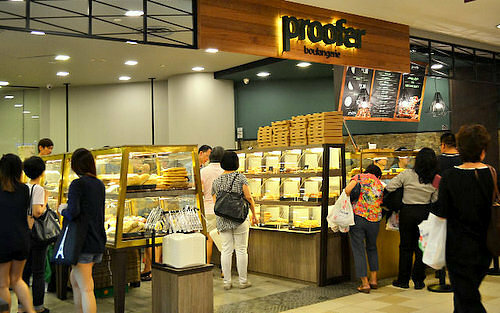 Boulangerie, patisserie, bakery, and pizzeria chain Proofer has a network of 20 outlets in Singapore, including one at Tampines 1 shopping centre (10 Tampines Central 1). Proofer is a modern concept bakery that delights mall customers with aromas of fresh, home-made baking that fill the air, welcoming all who visit with a warm embrace. At the Proofer Boulangerie & Patisserie outlets you’ll find a gourmet menu that consists of old favorites and an assortment of daily specials, with the signature item being Salted Egg Lava Custard Croissant. Every bite at Proofer bakeries is a creation that has been designed with taste in mind, where every variety of the creation is carefully constructed with perfect textures and contrasting flavours. For the bread varieties, Proofer uses a split between the French and Asian styles. The official Proofer Boulangerie & Patisserie Facebook brand page is located at www.facebook.com/prooferboulangerie. Following the Facebook page, you’ll receive updates about the changes to the menu, new and seasonal creations, promotional offers, events, and more.